Elvis Presley, known primarily for his singing and risqué stage moves, also created twenty-nine movies in which three were westerns and several included western scenes. Charro (1969) starring Elvis Presley was filmed at Apacheland Movie Ranch at the peak of his career and described as his best acting work. Apacheland was a well-known film and TV recording studio in Gold Canyon, AZ that tragically burned in 2004. It was a tragic loss to local residents as well as to the movie industry and the many tourists attracted to the lifestyle of the Old West. However, the Apacheland barn and Elvis chapel survived. Both were carefully moved to the Superstition Mountain Museum on the Historic Apache Trail (AZ Route 88) outside Apache Junction 32 miles east of Phoenix. The Elvis Presley Memorial Chapel exhibits movie & TV memorabilia of many Apacheland productions and is open to today’s Elvis fans and curious media buffs. 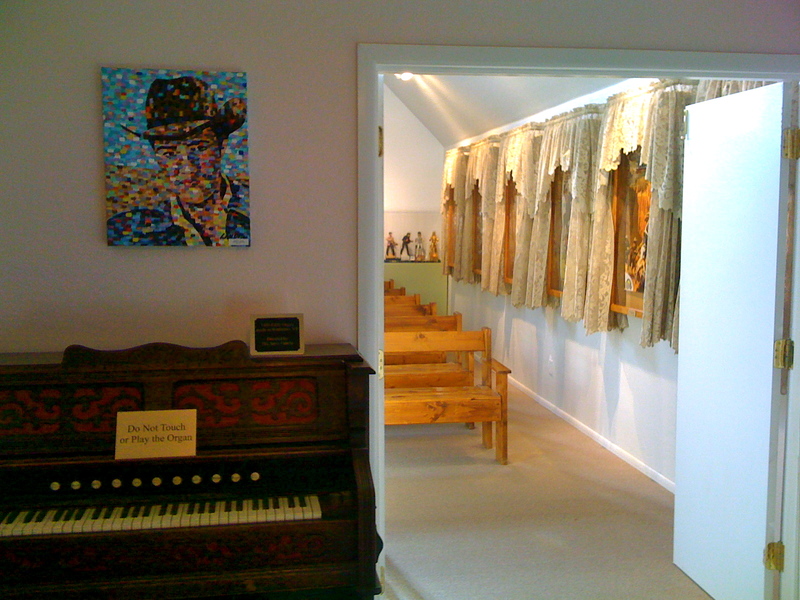 Visit the Superstition Mountain Museum to see Denise Landis’ unusual Elvis Art located in the bridal dressing room of the Elvis Presley Memorial Chapel located at 4087 North Apache Trail, Apache Junction, Arizona 85219.